Photographer Guilden Gilbert photographed Bahamas tennis legend Lady Edith Powell for the Bahamian Project. Ms Powell has not only accumulated numerous awards, honours and trophies, she has also had a trophy named after her. The runner-up trophy for the Doubles Championship at every Bahamas Open since 2012 is named the Edith Powell Trophy. As a former president of the Bahamas Lawn Tennis Association (1999-2002), Lady Powell has contributed greatly to the sport of tennis in The Bahamas over the past few decades. Through her passion for tennis, she has positively influenced the lives of countless young tennis players eager to improve their skills and compete on an international level. The first ITF Junior Tennis Tournament was held during her presidency. In 2014 Lady Powell was inducted into the National Sports Hall of Fame. While most widely known and celebrated for her contributions in tennis, Lady Powell’s work and good influence has gone well beyond sports. In one such example, she has served on the National Council on Older Persons, where she has worked to help facilitate programmes and solutions to address the needs and challenges facing the elderly. 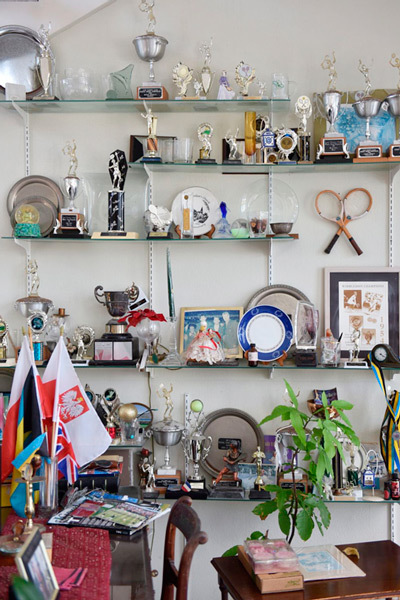 Guilden photographed Edith Powell at her home in Nassau, surrounded by her trophies.